What exactly is ear candling? Even though it might sound hard to believe, ear candling is a method that was used for removing ear wax by Ancient Egyptians. It is becoming more and more popular again, particularly for those people who prefer natural ways of treatment. Ear candling has proven to help in problems with sinus, headaches and pain in the ear, but there are also claims that it can help with hearing problems. Regarding the safety of this method, it is highly recommended to go to someone who has some experience with this method. Otherwise, people should be very cautious and careful that they follow the instructions thoroughly, because if done carelessly, it might be risky. Some of the dangers that this procedure involves are burns, injury to the ear, and even temporary deafness. Also, it is necessary to be aware of the fact that ear wax is important for the protection of the ears, which is why this method should not be used too frequently. For the procedure of ear candling, besides having somebody who will assist; ear candles, scissors, matches or a lighter, a towel, paper plate and a bowl of water are necessary. The person with the problem should lie on the side and make herself or himself comfortable. The assistant should cut a hole in the paper plate, which should not be too big, but enough for the ear candle to be inserted through it. Then it is necessary to cover the persons head with a towel, leaving the ear area uncovered. 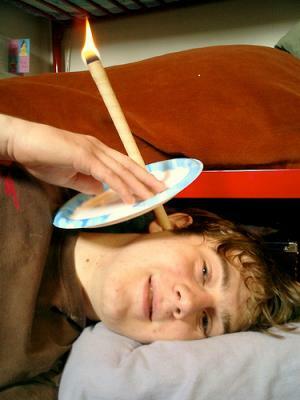 The narrow tip of the ear candle (which is inserted through the hole on the paper plate) should be placed in the ear and the non-tapered end should be lit. The ear candle should be held all the time, and in case some smoke appears out of the ear, it is a sign that the ear candle is not positioned properly. Approximately every two minutes the ear candle should be removed from the ear in order to clean the tip of it, and it is necessary that the tip is open all the time. The burned part of it should be cut with the scissors, and it should be done over the bowl of water. When there is no more than 3 inches of ear candle left, the procedure should be finished. The part that is left should be put out in the same bowl of water, and all of it should be disposed of. What is the best method for treating acute deafness? How do you trim your nosehair?